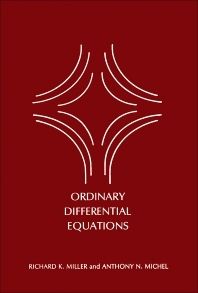 Ordinary Differential Equations is an outgrowth of courses taught for a number of years at Iowa State University in the mathematics and the electrical engineering departments. It is intended as a text for a first graduate course in differential equations for students in mathematics, engineering, and the sciences. Although differential equations is an old, traditional, and well-established subject, the diverse backgrounds and interests of the students in a typical modern-day course cause problems in the selection and method of presentation of material. In order to compensate for this diversity, prerequisites have been kept to a minimum and the material is covered in such a way as to be appealing to a wide audience. The book contains eight chapters and begins with an introduction the subject and a discussion of some important examples of differential equations that arise in science and engineering. Separate chapters follow on the fundamental theory of linear and nonlinear differential equations; linear boundary value problems; Lyapunov stability theory; and perturbations of linear systems. Subsequent chapters deal with the Poincare-Bendixson theory and with two-dimensional van der Pol type equations; and periodic solutions of general order systems.